We found this photo yesterday and wondered who could come up with the best caption to win a Vermont State Parkspunch card. Thank you everyone for participating we LOVED reading all of the submissions! We had over 180 submissions and it made our day more exciting. And here are the Top 10! 10. Sharon Palady: Hand over the quackers now or I'll bring my entire waddling family to your campsite... it may not be pretty when we leave... so hand over the quackers! 8. Cheryl Cobb: "Hand over the bread and nobody gets hurt"
7. Lisa Huebl McGunnigle: "Excuse me, could you please point me in the direction of the paddle boats, please?" 6. Crystal Miller: Yo, what's quack-a-lackin? 5. Lisa Ayers: Vermont State Parks are going to open soon, time to get quackin and get your gear ready! Okay......drum roll....the results are in. The winning image from the Vermont State Parks Water bottle graphic design contest is: Chad Yonkman! This season we were seeking a fresh new look for our Vermont State Parks Water bottles which are sold all over the state. So we held a water bottle graphic contest and we had 42 entries! Thank you everyone for participating and congratulations to our winner! 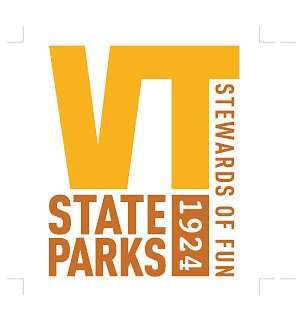 The goal was to come up with a 3" x 3" graphic design that embraces the personality or feeling of Vermont State Parks. The design had to include only 3 or fewer colors and be applicable on a variety of colors.